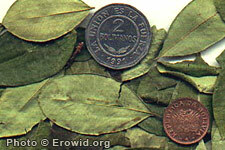 Erythroxylum coca is a high altitudes S. American shrub that's leaves are the source of cocaine. The leaves are "chewed" (held in the cheek) in combination with mineral lime to provide physical and mental stimulation and reduction in altitude sickness. It has a long history of human use. Is it possible to cultivate coca from seeds? What conditions do coca plants need to survive and grow? I was wondering if coca tea is legal? Are coca stems, roots or seeds illegal?